We headed up to the Shenandoah Valley area for a camping trip this past weekend. The main reason was for our annual trip to the summer rodeo. It’s held at the horse farm where my best friend rides, from May through September, and this weekend was the last one of the season. My best friend is on the grey horse. We stayed at the same campground that we’ve been going to for the past three years. It’s always nice to be somewhere familiar. Saturday was very rainy during the day so we mostly just hung out in the camper, reading, napping, and playing a lot of Gin Rummy. Luckily the rain moved out and we had really nice weather for the rodeo that evening. After my best friend was done with her drill team at the start (see first picture) she came and hung out with us for the rest of the night. As always, it was a good time. The second guy on the left (between the two far left American flags) won the whole thing. One of the downsides of driving in the south west direction in the evening is that the sun is in your eyes for most of the way. But the upside is that once the sun does start to set, you get to see a really drawn out sunset. And last night’s was a gorgeous one. When we got home it was cool and crisp and it was so clear you could see about a thousand stars. Always important to stop and appreciate things like that! 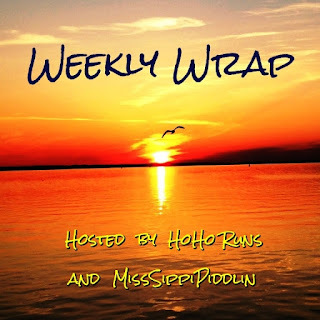 I also wanted to briefly recap my workout week, as part of the weekly wrap link up hosted by HoHo Runs and MissSippiPiddlin’. Monday – 3 mile run in the afternoon. It was 85 degrees and humid, and I was reminded of the importance to bring water on hot runs no matter the distance. Wednesday- 6 mile long run in the evening. I was pretty tired from a long work day, but I felt pretty good during my run. I got my long run in early since we would be traveling and I didn’t want to do my long run at that campground (this is why). Friday – 3 mile run in the evening with Barry after we got to the campground. Do you have any end-of-summer traditions? Good ride, cowboy, good ride! Saturday Night Rodeo – pull your hat down tight, and just Ledoux it! End of summer tradition – depressed. Summer is over. Just gotta start living the Jimmy Buffet life. Summer will never end. No end of summer traditions. We went to the rodeo a couple of times when we lived in Austin. There’s one here, too, but it’s not quite the same in upstate NY, or at least I imagine it isn’t since we haven’t been to the one up here. Sounds like a great week & good luck Sunday! Thanks! I would imagine a rodeo in Texas would be pretty different from one on New York, but who knows!? No end of summer traditions either. Since I’ve been out of college for a few years, I don’t really do anything to mark the end of summer. And fall is slow getting here so there’s this in-between season that I don’t know what to call. Hmmm pre-fall maybe? I like having one last ‘hurrah’ to mark the end of summer, even though there’s no real change in my work/daily routine. Sounds like a fun weekend! I’ve been to a couple of rodeos in the past, I also rode in a drill team that would occasionally perform. But I haven’t been to one in a really long time. They are fun! Very cool that you used to do drill team, too! They just added to that to the rodeo this year. Ahh I knew there was a connection to you, my family barrel races and we are very familiar with rodeos as well. I would say camping and a rodeo, well it just doesn’t get better than that! Thank you so much for linking up with us this week! Bring on the Fall! Ah ha, very cool! I don’t think I mentioned it, but in addition to the drill team and bull riding this rodeo also had barrel racing and mutton busting (so cute!). It’s a professional rodeo that travels around, and they come to this horse farm the second Saturday of every month during the summer. They’ve even put a few bulls into PBR, which is pretty cool! I have been to a few rodeos. They are lots of fun! The campground you stayed at looks so pretty and shady. I’m sad to see summer go in a way (no more water skiing) but I am ready for cooler running. NO doubt. Good luck in the Hokie Half this weekend! Thanks for linking up with us today! They definitely are, and I love the atmosphere! That campground is nice and shady, and usually very quiet, too. The only horse shoes/rodeos I’ve ever been to were at the RV Fair, but that’s been years!